Are you the mother or father of a young lady who could use some positive focus and energy? This mentoring group experience is all about helping these amazing daughters to claim their birthright. We will be teaching tools that will help them gain clarity on who they really are. If you have a daughter who would like to move her self worth to the next level towards Father, then this is a group for her! Young ladies ages 10 and up are invited to join this very special group mentoring experience along with their mothers. This group is interactive, fun and enlightening! inspirements created ﻿& SMILES ARE HUGE! Each participant on this group will be part of a private Facebook group (optional) with lots of awesome support daily! Your daughter and YOUR WORLD will never be the same! Empowerment comes when you see you can really make a difference in the world, when you recognize WHO YOU REALLY ARE, a daughter of the King! Tammy & Aubree Ward, along with some other guest speakers throughout the year will make this an experience that will ROCK your whole world! Tammy Ward still feels like a teenager on the inside but she has sure come a LONG way since those days! As an intuitive healer and empowerment mentor, she can teach tools to help you come out of darkness and into the light once more. Recognizing the beautiful, cherished daughter of a King that you are IS a total game changer!! 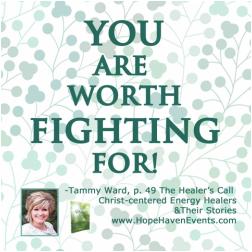 Let Tammy remind your spirit who you are and help you create the life you desire. Tammy is the happy mom to 8 awesome kiddos. She is best known for being an inspiring change agent. Aubree Ward is a vibrant 15 year old young woman and the second of eight children. She has been homeschooled since the first grade and loves it! She has been instrumental in helping plan and deliver many events with Hope Haven Events over the past few years. She is naturally gifted at photography, photo editing, Christ-centered energy healing and lifting others. Aubree is loads of fun and the "light" of the party wherever she goes. She is a natural gatherer and friend to all around her. She loves inspiring others to reach their greatness and to help them remember who they are. We have done everything in our power to create this amazing experience at a super affordable rate so that ALL can participate! The exchange is $39 per month including mom and daughter together! It's only $10 more for each additional daughter after that. This is a nine month experience as each month will build upon previous tools learned. We know that at the end of this experience your daughter will have learned who she is, where she is going and how to get there.